History tells us on April 26, 1865 John Wilkes Booth was cornered and eventually shot at Richard Garett’s barn at Point Royal, Virginia ….or was he? Then as now, the rumors and speculation of his escape from the fiery blaze of the barn and the Union gunshot still resonate even today. Based on that speculation, it enables one’s imagination on a story of desperation, an exodus, repentance and hiding in plain sight with an alias as John Singer…or did he? This fictional representation of Booth has actual historical references and in some instances pertinent civil war and post-civil war situations woven into the fabric of the story. This fictional version romanticizes the complicated Booth yet never for the crime he had committed. In this fictional account Booth is repentant for his crime. So,in surviving the horrific fiery blaze that the world believes ended his life, a singular man is given a second chance, to live, to right the wrongs and possibly find true love. It is early May, 1865 when John Singer meets Emma Dixon at the war hospital in Alexandria, Virginia, his body broken his spirit unwilling to fight as a fever rages within him. But with one glance from his smoldering, black, and bottomless eyes Emma knows he must survive. John’s heart is stolen by her beauty, and kindness. She is all that is good in life, honest and caring. But his true identity becomes his darkest secret. 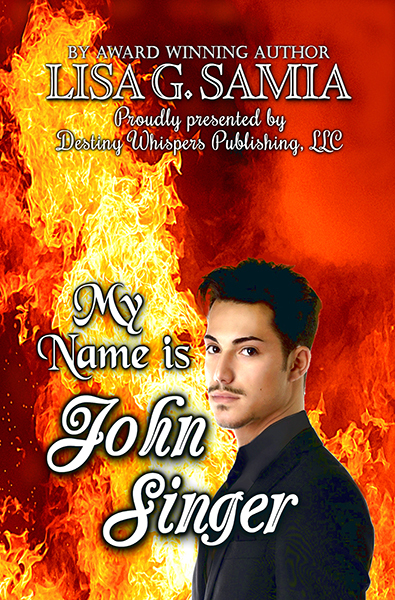 The secret within him burning like the blaze that the world believes took his life. For the handsome and compelling Confederate solder known as John Singer IS the notorious assassin, John Wilkes Booth.